Roger Lanctot, Director, Automotive Connected Mobility in the Global Automotive Practice at Strategy Analytics. Lanctot was recently in Tel Aviv, Israel, where he shared some interesting insights about the connected car and future mobility trends. The connected car bridges vehicles with the IT world, which resonates strongly with the HDBaseT Alliance, as it is a reminder of how the AV and IT world are converging. At the end of the day, connectivity – whether at home, in the office, or in the car – means the same thing: transferring data from point A to point B, and HDBaseT is optimized for that. Vehicle cybersecurity is a constantly evolving issue, particularly because the threats around us are constantly evolving. That is why it’s necessary to be proactive in this respect – so that we can act instead of react in light of a threat. This is another reason the Alliance recently established its Cybersecurity working group. In-vehicle embedded systems increase cybersecurity in passenger vehicles. But for these systems to work, the underlying infrastructure needs to be robust and optimized to guarantee faultless performance. That’s where HDBaseT Automotive comes in. One thing we know for sure: automotive connectivity is a hot topic in the field – one that OEMs, Tier 1 and 2 suppliers, and anyone in the auto market follows very closely. 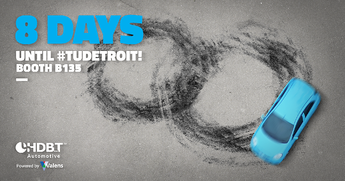 We look forward to being in Detroit next week, and discussing the topic with TU-Automotive attendees. Are you attending the show? Stop by our booth (B135) to say hi and see how HDBaseT Automotive is transforming in-vehicle connectivity.